I was lucky enough to finish in the Top 10 of Fantasy Premier League (FPL) and as #1 in Norway! Firstly, I would like to mention that due to the nature of FPL I find good previews more impressive than summaries and I don't worry about who I captained in hindsight. I say this because my choices obviously paid off enough to get me this high, but I could just as easily ended around 10k, or even lower. Starting from the first week, I actually did less work on my team than previous years. I usually enjoy tinkering with fun and "original" ideas, but decided that this year I would drop all differentials, and just try to keep to the biggest hitters. This tactic worked wonders, as there was such an abundance of great low priced players, exemplified by Kane and Austin in their peak periods during the 2014/2015 season. As stated, I wanted a strategy with as few differentials as possible, and focus on having as many heavy hitters as possible. That meant I always strived to get players such as Aguero, Silva, Hazard and Sanchez into my team as soon as possible. My thinking was that I didn’t want to have a GW where I would lose massive amounts of points compared to everyone else above me, and rather hope that I will have more heavy hitters than most and that will benefit me in the long run. Of course I still had bad GWs. But as per the team's URL below my “bad” weeks didn't drop me too much down in the rankings, because the average score tended to be low as well in those weeks, while my good weeks tended to be extremely good for my team. I developed a line of thinking that made my picks similar to the teams higher than mine, with choices such as Terry, Ivanovic and Diego Costa during their peak weeks. I would have preferred having more variation but didn't want to be at a disadvantage and be cut off from the higher teams. On a final note, the most single important decision I made this season was to use the Wildcard in Double Gameweek 34. I chose 3 Liverpool midfielders and while that was pretty bad at the time I still stand be that decision, as the wildcard as a whole gave me the tools to launch myself into the Top 10. It made it possible for me to double up on Leicester defenders and freed up funds for Silva and Arsenal midfielders. As I mentioned at the start, I love to watch teams, and that also gave me the knowledge (and punt) to use the Wildcard to drop Kane and Clyne, while benching Giroud and Van Aanholt for GW37. So while the "Triple Liverpool" didn’t work originally, I got many other calls spot on. This, together with a lucky line of clean sheets from Hull and Double Leicester gave me the standing I needed for my #8 global finish in the 2014/2015 FPL season. Kåre is an Arsenal fan from Norway. It's Saturday night. FPL managers across the globe are hemming, hawing and second guessing themselves as the most unpredictable gameweek of the year, and ironically the one that will decide many minileagues and whether you will beat your best ever overall annual rank so far, beckons in just a few short hours. Depending on who you are, you're either optimistically uncertain, super duper scared, so conservative as to essentially be throwing in the towel, or an evenly balanced combination of the three. Either way, you're staring at that squad, cycling through all of the possible outcomes in your mind, most certainly none of which will actually happen, and you swear that somewhere out there there's a person, or a website, or a random contact "in the know" who will solve all of your problems for you and provide a feeling of artificial certainty that is actually no more certain than the dozens of rumors you've been reading for the past four days. And this is how we all start GW38; where the FPL powers that be have determined that the deadline for possibly the most influential gameweek of the year will pass a full 3 1/2 hours before kickoff of 10 simultaneous English Premier League football matches; perhaps the most entertaining two hours in sport. Despite my own personal uncertainty, I'm looking forward to seeing how it all plays out on Twitter. The 2 1/2 hours between 6:30 a.m. EST and the time that all 20 lineups are revealed will be some of the most nailbiting hours of the year. Tensions will be high, nerves will be taut; and that's just to see who will play and who will not. An hour after that the real excitement will begin. For the very last time, the game is currently being updated. Please try again later when the updated scores / teams will be available. And the last FPL deadline has passed. Already looking forward to the endless valuation prediction tweets come July! Good luck today guys!! Singing off with: £Shop defenders. Baps. Stats don't lie. Boxing Day "Massacre". CATHORLA. N'Doye joy. #MNF Magic (Fab). Hadouken! Blondie. No Ramsey either. Walcott up front. @FPLWalt I am so jealous! @FPLWalt Wow!! What a place that #BeantownTavern is, enjoy the day Walt!! Offsides again for Hull. 2 called back within minutes. Fletcher gives the Sunderland the lead versus the on vacation Chelsea. Subbed out Cazorla for Mata. Mata doing nothing. Cazorla already bagged 2 assists. Nightmare. Stoke showing Liverpool some mercy as Walters gets subbed off. Hazard assist. Obviously as 300k managers sell him. FRANK AND STEVIE BOTH SCORE!!! All I'm asking for is a Kun goal. I beg. Fellaini remembers who he is and gets a red card for a reckless challenge. Aguero needs to score for me to remain in the top 5k. Disgusting tackle from Fellaini. Deserved a Red card for that. Come on West Ham. Make it bloody interesting. 6-1 To Stoke! Unreal scenes. Sad scenes as Hull and their fans now know they are going down. Hang on West Ham. He hasn't even left the building yet. I'm done. That #FPL season was a hard slog summed up by template teams, unfortunate captain picks & too many points hits. Glad of the rest. when does the season start. thats too long, whatever you said. @FPL_Fly @fplhints My first time ever playing FPL. Finished in the Top 10K worldwide and won my office pool. Thanks for your help guys. Congratulations to @FPLCoach - winner of the inaugural @playtogga Premier League! @Kevrov takes 2nd, @PremSoccerChat finished 3rd! The end of the FPL season. Well done to everybody and a huge thanks. Back with a bang next season! Well there you have it folks...a fitting, all-inclusive end to another fantastic FPL season. We've all had more highs and lows than a park full of roller coasters, but we made it through the craziness of this game we all love and we made it through stronger and closer together than we've ever been. FPL keeps growing, our Twitter FPL community keeps growing, the competition gets fiercer every year, and through it all we share a passion that is real, that is strong, and that is unique. We need some way to identify other FPL addicts in a crowd so we can pass each other on the street and give each other a knowing smile, a quick nod, and some sign of empathy that says, "I'm with you bro.... we'll all get through this together". ENJOY THE SUMMER AND WE WILL SEE YOU SOONER THAN YOU THINK!!! Proud contributor to the Fantasy Premier League Hints family. As per the podcast, I don't tend to have good archival form for the final Gameweek of the season. As a result, I really didn't want to take a hit. This will remain the case unless I make a last minute "light bulb" transfer on Sunday morning. 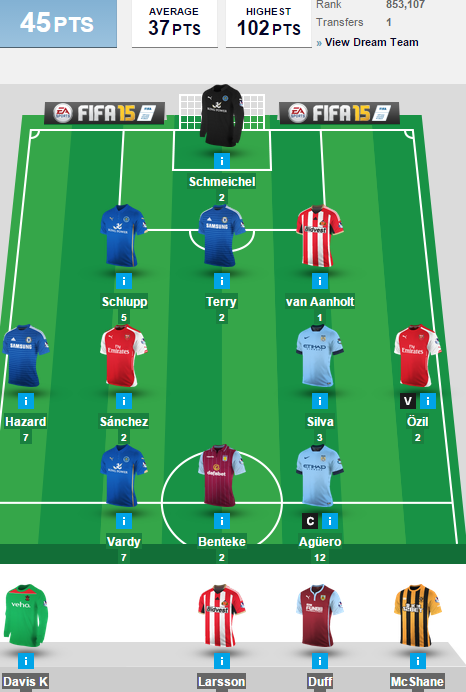 A 35k overall finish would be fabulous but will require fantasy returns from most of my players. So here we are; Gameweek 38. The marathon is almost over and the 2014/15 FPL champion is about to be crowned. Conventional wisdom says that the final day doesn't have many clean sheets, has squad rotation and lots of random results. It was with such considerations in mind that I wanted to take it easy and not go gung-ho. Despite this, I seriously considered doubling up at the back by buying John Terry - I think Chelsea will be favourites for a clean sheet win at Stamford Bridge as Sunderland are safe for another season. I also looked at buying Lampard for his final PL hurrah match, but I fear that he may only make a cameo appearance. 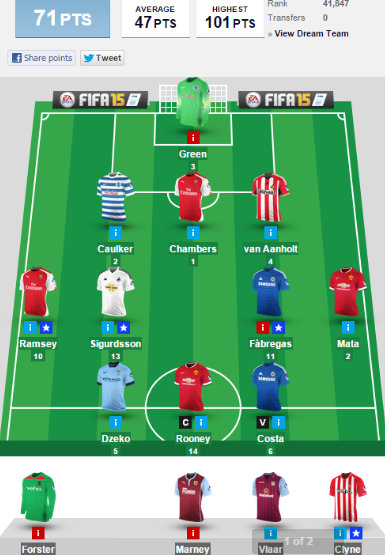 Ozil had to go due to his lack of fantasy returns. Out of all the options at hand Yaya sprung to mind, due to his brace last weekend and awesomeness since 2013. He is probably playing his final game for Manchester City and will want to finish on a high. 30 goals in his last 63 PL games makes him an absolute must have. He will be wanting to show his suitors as well as City's fans his true explosive nature by scoring again. Aside from that I can't justify taking a -4 hit for any other player. What's the point if there's no Gameweek 39? 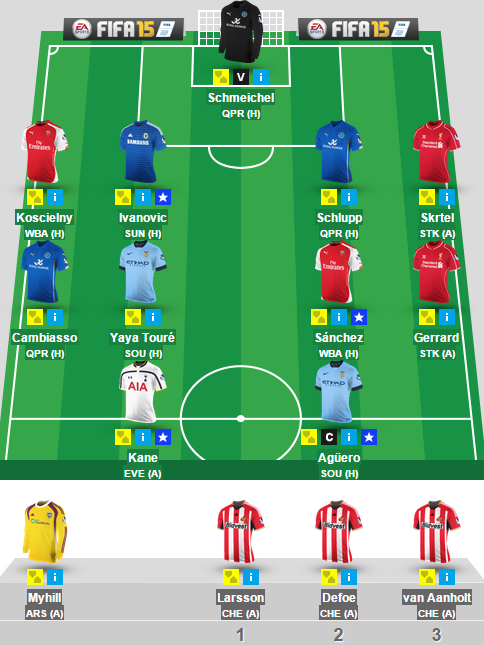 As for my captain, I decided to keep it safe and choose Aguero. His recent goals, as well as his famous 90+4 goal in 11/12 makes him the perfect captain candidate for Gameweek 38. As for Schmeichel being the vice-captain, why not? I wish you all the best for Sunday and hope that you have enjoyed my fantasy football adventure. I will jot up my end of season review in due course. Apart from that I will mull over future plans in the summer. Welcome to the final instalment of FlyBuy. This is a feature that has enjoyed incredible highs (Matty Phillips in GW28-32, Jamie Vardy in GW32-36) and disappointing lows (Eden Dzeko in GW16-20, Mile Jedinak in GW27-31) but overall its been a hit and miss kind of season. As regular readers will know, the FlyBuy pick is based on a player who - for one reason or another - has been out of form, not playing or returning from injury and who I expect to provide some decent points returns during a 5 gameweek window. My picks are based on my own tried and trusted method of selection, that I call "WAG Theory" or to give it its full title, "Wild Assed Guess Theory". The final day of the season is close at hand and with only a few league positions yet to be decided most teams don’t have much to play for. From a chairman’s point of view each league position is worth £1.2m so they’ll be putting the pressure on their managers to do their best to climb the rankings. In the same way we’ll be hoping our FPL teams make a late dash up the rankings to achieve as high a finish as possible. Below we've got a brief preview of each game that makes up GW38 plus a player from each team to consider as you look to win or climb your mini-leagues. West Brom visit the Emirates on the back of an impressive 3-0 victory over the champions on Monday evening whilst the Gunners have all but confirmed 3rd place and automatic qualification to the Champions League group stages. With their focus now firmly on the FA Cup final against Aston Villa, Wenger will undoubtedly rest a few of his first teamers, which is bad news for those of us who loaded up on Arsenal’s stars prior to the double gameweek. Joleon Lescott – With 4 clean sheets from the last 5 games including games against Liverpool, United and Chelsea, another shut-out isn't out of the question and Lescott carries a goal threat from set pieces too. Villa were embarrassed by Southampton last week and will be in two minds this week. They won’t want to go to Wembley in terrible form lacking confidence but they’ll want to rotate players and keep them fresh. Burnley are preparing for life in the Championship and will hope to finish the season on a high whilst some of their players will be in the shop window hoping for moves back to the Premier League next season. Tom Cleverley – With 3 goals in his last 5 appearances he’s a man in form and will want to carry that to Wembley. Danny Ings – In what is very likely to be his final game for Burnley he’ll want to go out with a bang against a very poor Villa defence. A match that has nothing riding on it after Sunderland’s hard earned draw away to Arsenal on Wednesday ensured their Premier League safety. Neither team will be particularly up for this which means anything could happen – as we saw at the Hawthorns on Monday. Diego Costa – A player of undoubted quality that is owned by very few live teams. Fit enough to start on Monday evening he could be a real differential for this week. Costel Pantilimon – 2 clean sheets last GW and plenty of save points up for grabs. Sunderland look more likely to keep a clean sheet than score against Chelsea. Palace have the worst home record in the league but still have the potential to finish in the top half if they win and other results go their way. Swansea’s position in 8th is secure but they’ll want to enjoy their last away day of the season. Yannick Bolasie – If he can get his shooting boots on he can grab a few goals. He’s often in great positions but has struggled to finish the chances off all season. Bafetimbi Gomis – 5 goals in his last 5 appearances shows he’s a man bang in form. Spurs could finish 5th with a win but were unimpressive against Hull last week despite their win whilst Everton will want to finish their very average season with a home win to give fans some hope of success next season. Romelu Lukaku – A low ownership striker with 20 points in his last 3 games against a poor travelling Spurs defence. Erik Lamela – 3 attacking returns in his last 5 games shows his potential. This match means everything to Hull. They need to win and hope Newcastle fail to beat West Ham to secure their status in the Premier League. United have just 1 win and 3 goals in their last 5 games so it looks to be the ideal time to play them but it is still quite an ask of Steve Bruce’s team. Nikica Jelavic – The striker has enough quality to get the goal Hull need to stay up and he looked sharp against Spurs despite his recent injury woes. Ashley Young – The winger has shown plenty of attacking promise in terms of both assist and goalscoring potential recently. The Foxes secured their Premier League status last weekend whilst the Rs are destined for the Championship. QPR are woeful on their travels and Leicester will want to give their fans an end of season party. Leonardo Ulloa – A strong aerial presence could see him take advantage of the shaky QPR back line. Matt Phillips – One of just a few shining lights in the QPR squad this season has shown he can be an explosive FPL points scorer. Both teams have scored 6 goals in a game recently but Man City have been in much better form with Southampton losing a couple of games against supposedly weaker teams. Southampton know though that a win combined with a couple of other outcomes this weekend could see them finish as high as 5th which would all but guarantee Koeman the manager of the year award. Yaya Toure – Probably his last game in a sky blue shirt so he’ll want to continue his goalscoring form from last weekend. Shane Long – Back in the starting lineup last week with 2 goals and 2 assists against Villa. Newcastle need a win to guarantee survival regardless of what happens at the KC Stadium. However, Sam Allardyce will be out to do all he can to send his old employers down to the Championship. Neither team are in good form so it will be a tight affair in what could be a crucial game this weekend. Mark Noble – The pressure could get to the Newcastle defence and cause them to give away a penalty for the West Ham midfielder to put away. Liverpool need a win to confirm 5th place whilst Stoke are guaranteed of a top half finish. Stoke surprised Spurs at the Britannia a couple of weeks ago and could do the same against Liverpool this week who only have 1 win in their last 5 games. Jon Walters – Plenty of shots inside the box recently suggests he’s been unlucky not to get on the score sheet. Steven Gerrard – After all of the media attention last week, Gerrard will be looking to make his mark in his final Premier League game.